1.1.1. Regular Election of Class Representatives of the Student Senate. 1.1.1.1. The incumbent class representative will serve as election officer to coordinate and conduct the regular election of a successor class representative for the class that he represents. 1.1.1.2. If there is no incumbent class representative for a class, the president will appoint a seminarian from that class to serve as election officer for the regular election of the class representative. 1.1.1.3. The election officer shall provide reasonable notice of the date, time and place of the class meeting at which the regular election of the class representative will take place. Such notice may include written notice placed in the seminarian mailboxes and/or posted on the one-day board and/or oral notice made at a community or class event at which attendance of all class members is mandatory. 1.1.1.4. The election officer will preside at the meeting for the regular election of the class representative. There must be a quorum of at least 25% of the class members before the regular election of the class representative may be conducted. If there is not a quorum at the meeting, the election officer shall suspend the meeting and reschedule the election to another meeting, providing the same notice as required above. The election officer will also circulate a sign-up sheet for those present at the meeting, to be provided to the Dean of Students. The election officer will ask the Dean of Students to take disciplinary measures against those class members who failed to attend the meeting without a legitimate excuse. 1.1.1.5. At the class meeting, class members may nominate other seminarians or themselves to serve as class representative, although each seminarian who is nominated must agree to the nomination before his name may be considered as a candidate for class representative. 1.1.1.6. When nominations are closed, either upon a motion that is approved by a simple majority of votes cast by class members or because there are no further nominations being made, the election officer shall instruct all candidates to leave the room and retire to a place where they cannot see or hear any of the proceedings in the meeting room. The election officer shall then offer a reasonable opportunity for class members to address the class regarding any of the candidates. 1.1.1.7. The election officer shall then take a vote of the class members present by show of hands for each candidate. If there is no candidate who receives a simple majority of votes cast in that first vote, the election officer shall immediately conduct a second vote by show of hands for the two candidates receiving the most votes in the first vote. If that second vote results in a tie, the election officer shall immediately conduct a third vote by show of hands for those same two candidates. If the third vote still fails to produce a simple majority of votes cast for any one candidate, the election officer shall suspend the election and schedule the election for another class meeting to be held following a reasonable time for the class members to deliberate on this matter. At that next meet- ing, the election officer shall conduct the election repeating all of the procedures described above, including notice of meeting, nomination of candidates, discussion, and all necessary votes to achieve a simple majority of votes cast for one candidate. 1.1.1.8. Each seminarian may cast one vote for class representative and must be present at the class meeting to do so. No one may vote by proxy. 1.1.1.9. The election officer will provide to the president written notification of the class representative elected. 1.1.1.10. 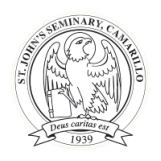 For purposes of these Bylaws, “class member” or “class members” means class member/s who are seminarian/s living in residence at St. John’s Seminary. Notice of Student Senate Officer Elections. 1.1.2.3. The election officer also will make an announcement about the election at a community event at which attendance of all semi- narians in residence is mandatory at least once during the week preceding the election. 1.1.2.4. The election officer will preside at the meeting for the regular election of officers. There must be a quorum of at least 25% of the seminarians in residence before the regular election of officers may be conducted. No one may vote by proxy. It there is not a quorum at the meeting, the election officer shall suspend the meeting and reschedule the election to another meeting, providing the same notice as required above. The election officer will also circulate a sign-up sheet for those present at the meeting, to be provided to the Dean of Students. The election officer will ask the Dean of Students to take disciplinary measures against those seminarians in residence who failed to attend the meeting without a legitimate excuse. 1.1.2.5. After the election officer calls the meeting to order, he shall announce the candidates whose names appear on the written notice posted on the one-day board. The election officer shall also write those names under the respective offices on a large sheet of paper, white board or some other medium so that everyone in the meeting room is able to see it. The election officer shall then ask if there are any other nominations for any of the offices. Seminarians in residence may nominate other seminarians in residence or themselves to serve in any of the offices (subject to the qualifications provided by the Constitution or these Bylaws), although each seminarian who is nominated must agree to the nomination before his name may be considered as a candidate for any office. The election officer shall write the names of the seminarians so nominated under the respective offices on the large sheet of paper, white board or other medium. 1.1.2.6. When nominations are closed, either upon a motion that is approved by a simple of majority of votes cast by seminarians in residence present at the meeting or because there are no further nominations being made, the election officer shall instruct all candidates to leave the room and retire to a place where they cannot see or hear any of the proceedings in the meeting room. The election officer shall then offer a reasonable opportunity for seminarians in residence to address the meeting regarding any of the candidates. a tie, the election officer shall immediately conduct a third vote by show of hands for those same two candidates. If the third vote still fails to produce a simple majority of votes cast for any one candidate, the election officer shall cancel the election for that office and that office shall be considered vacant. 1.2. Special Election of the President. A special election for president of the Student Senate shall be conducted according to the procedures for the regular election of officers. 1.3. Special Elections of Class Representatives. The president will appoint a seminarian to serve as election officer for the special election of a class representative. The special election will be conducted according to the procedures for the regular election of class representatives.